The software as a service (SaaS) model of application delivery, more commonly known as ‘cloud deployment’, in which software features are accessed through a Web browser, is an excellent way for manufacturing companies to get the benefits of enterprise resource planning (ERP) systems without the need to build additional IT infrastructure. ERP functionality delivered “from the cloud” avoids the complexity and costs that often accompany on premisess ERP implementations, and typically provides a much more favorable total cost of ownership, compared to legacy on premisess deployment. Companies subscribe to the software features that they need and can add new ones as business requirements change, without buying additional servers or storage to support new functionality. The ERP features are the same as for an on premises ERP system, except that it is hosted and maintained on the Cloud provider’s infrastructure. Epicor Software Corporation is a leading developer of ERP software and systems based in Austin, TX, with more than 40 years of experience in building ERP systems for thousands of customers around the world. 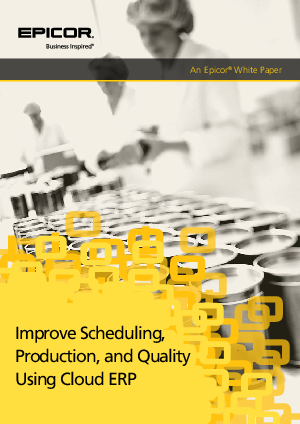 Christine Hansen, a product marketing manager at Epicor with experience in the manufacturing business sector, presents some of the best practices used by discrete manufacturingrs. She also explains the benefits of the Epicor Cloud deployed ERP solution.